As the dust settles on another fabulous night at the British Sports Journalism Awards, JON BATHAM relives the occasion. Suffice to say, if The Guardian’s all-conquering sportswriters were slow to their desks this morning it’s unlikely ‘The Beast from the East’ accounted for any late mark. 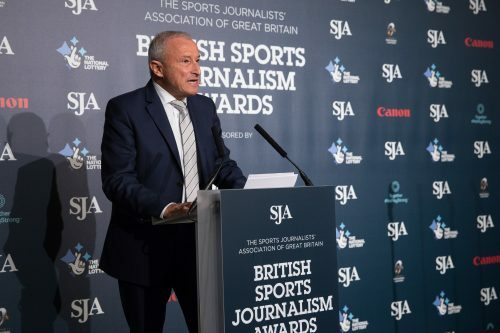 They could be excused for sporting the odd sore head, born of what former rugby prop Gareth Chilcott once termed ‘a quiet drink and 15 loud ones’ in the wake of sweeping success at the SJA’s British Sports Journalism awards. The incomparable Daniel Taylor and his colleagues leave not so much a footprint as an indelible mark in the mere dusting of snow brought to the vicinity of the Westminster Bridge Park Plaza, scene of British sports journalism’s biggest annual jamboree. For the team whose London headquarters are a stone’s throw from the Queen Elizabeth Olympic Park, this was a truly golden night as they scooped seven of the 15 print awards on offer, including many of the biggest prizes. Even so, on an evening which feted stars of broadcasting and photography too, they were not the only big story in town. The sport of boxing packed an Anthony Joshua-sized punch, both in print and through the medium of radio, while a doyen of almost three decades behind the lens enjoyed his finest hour. Some continued to rule their respective categories, while others were usurped by those who had previously clung to their coat tails. And in a further highlight, a grandee of print was duly saluted just days on from hanging up his editorial boots. This was though very much the Guardian’s night. 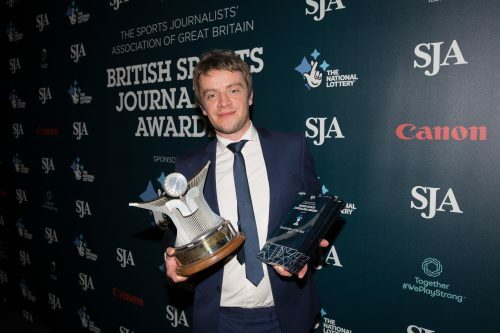 Taylor landed the biggest print prize of them all, Sports Writer of the year – a clear winner in the eyes of rival editors who must covet having him in their ranks. The Nottingham-born wordsmith had earlier completed a hat-trick of wins in the Football Writer’s category, sponsored by UEFA Together #WePlayStrong. 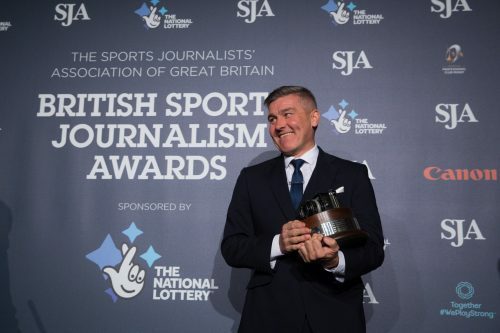 And he may well have carried off Scoop of the year for his Eni Aluko ‘Bullying in Football’ expose had it not been for colleagues Martha Kelner and Sean Ingle taking the prize for lifting the lid on Chris Froome’s failed drugs test, a revelation which left rivals chasing the game. Donald McRae joined their roll of honour with the Sports Feature Writer accolade, while Ingle further added to the stash with the Special Correspondent laurels. Add in the honour of being named ‘Best Sports Website’ and it was no surprise when the team carried off ‘Sports Newspaper of the Year’ to boot. Among other notable print awards, Boxing News cleaned up in the Special Sports Edition category for the second year running, their 100 Greatest British Boxers a triumph of research for Matt Christie and his team. That wasn’t the only nod to pugilism on the night as Ronald Mcintosh collected the Radio Sport Live Broadcast honours for BBC Radio 5-Live’s Joshua/Klitschko coverage and BBC Radio Leeds’ absorbing tale ‘Pretty Boy’ – a tale of bare knuckle boxing took the Radio Sport Factual prize. Each took the opportunity to pay sobering tribute to Scott Westgarth who tragically lost his life after winning a fight in Doncaster on Saturday. Broadcast Sports presenter Mark Chapman proved a popular winner, choosing his moment on stage to send a message of support to Sky’s Simon Thomas, still grieving the tragic and sudden loss of his wife Gemma to leukaemia. Such messages show a competitive industry still has room for a compassionate heart. Richard ‘Dickie’ Pelham dominated the photographic gongs, a coup for the tabloids, winning Sports Picture, Football Portfolio and the big one ‘Photographer of the Year.’ To see a man never usually short of a word, increasingly lost for them amid rising emotion said much for his enduring passion for the industry. As a young journalist, I remember learning from Anthony Clavane about the wineglass feature – leaving a kick in the tail of your piece. It therefore seems fitting to end with David Walker as the deserving recipient of the Doug Gardner Award for services to Journalism. He of course protested there were others in the room more deserving – but that’s David Walker (pictured above). His absence from the editorial floor leaves a huge void, though he has pledged to remain an influence on the SJA committee for now at least – Amen to that.